Metamaterial Technologies Market size was estimated over USD 500 million in 2016 and the industry will likely grow by a CAGR more than 20% up to 2024. Worldwide increase in mobile wireless communication systems will propel the metamaterial technologies market from 2017 to 2024. These technologies are being increasingly used in wireless communications as their acoustic and electromagnetic characteristics are developed from their molecular structures. Conventional resonant and broadband antennas are being gradually substituted by metamaterial antennas in wireless communications as the latter can be used in emerging applications such as radio frequency identification (RFID) systems. Inability of conventional antennas in fulfilling the requirements of modern communication systems has led to a surge in demand for the product in recent years. Global mobile wireless penetration is expected to be beyond 99% in 2024 and will be a major boost for the metamaterial technologies market. Increase in funding by venture capital firms in North America for start-ups that are involved in this industry will also be a contributing factor for the industry growth during the forecast period. These firms provide financial capital, valuable expertise & advice, and industry connections to the product manufacturers. Development of graphene-based products can lead to its usage in the medical sector, mostly in diagnosis and treatment of neurological diseases. Its unique properties such as superior mechanical strength, light weight, high electrical conductivity, elasticity, and surface area helps in its usage in functional neurosurgery, spinal surgery, cancer treatment, and intensive care unit monitoring. This may prove to be a tremendous opportunity for the global metamaterial technologies market in the future. Majority of these products and technologies are in the prototype stage and may need years of R&D for commercialization. Lack of awareness on part of consumers regarding the benefits and advantages of these product may impede the industry growth and hamper the global metamaterial technologies market during the forecast period. 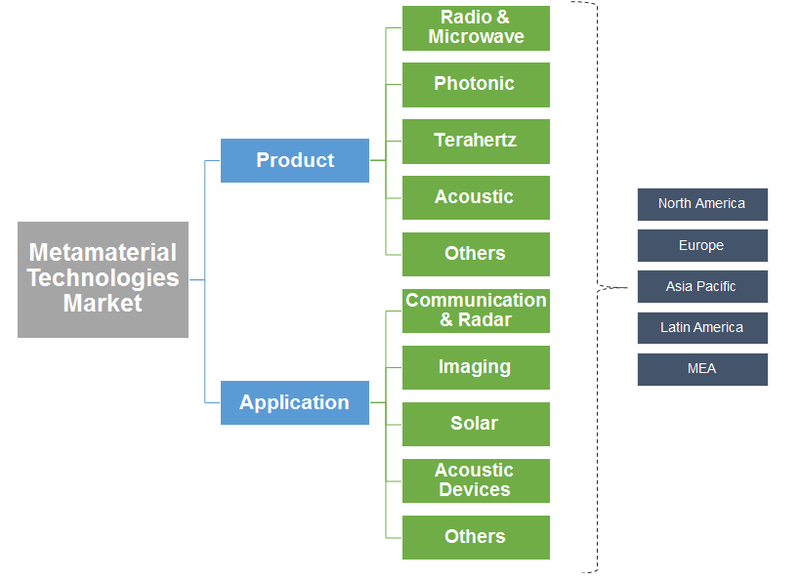 Global metamaterial technologies market is segmented, based on product types, into photonic, radio & microwave, acoustic, terahertz, and other products such as infrared, ultraviolet (UV), etc. This radio & microwave product segment is expected to occupy a significant share of the metamaterial technologies market during the forecast period owing to the products usage in radar & communication, navigation and spectroscopy applications. In 2016, this segment generated revenue more than USD 250 million and will witness a fast-paced growth at a CAGR of more than 22%. Photonic product segment share of the metamaterial technologies market was more than USD 95 million in 2016 and the segment is projected to grow by more than 20% CAGR during the forecast period. This growth will be chiefly propelled by the employability of the product in various applications including beam steerers, cloaking devices, microwave couplers, and antenna radomes. Extensive research in the product segment by companies such as Nano-Meta Technologies will also be a driving factor for photonic metamaterials market in the future. 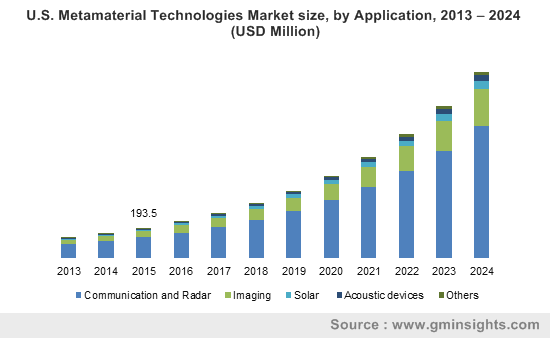 There are four major application categories in the global metamaterial technologies market which include communication & radar, imaging, solar, acoustic devices, and other applications such as cloaking devices, seismic protection, etc. Solar application segment revenue in 2016 was more than USD 30 million and is expected to grow at a substantial rate in the coming years. The growth of this segment will be propelled by rising clean energy demand and the product’s advantages over other solar panel coating materials. Communication & radar application segment earned a revenue of more than USD 350 million in 2016. This segment is projected to occupy a significant share of the global metamaterial technologies market as they are used for wireless communication, space communication, GPS, satellites and in commercial, civil and defense radar. North America is a major metamaterial technologies market accounting for more than half of the global share in 2016 and earning a revenue over USD 300 million. This region is expected to witness high growth due to generous grants by the U.S and Canadian governments to companies involved in research on radio & microwave, optical, and acoustic products. Demand for the product from consumer, industrial, and defense applications will likely augment the regional market. Asia Pacific metamaterial technologies market was valued above USD 85 million in 2016 and is expected to grow healthily in the forecast spell. China, India, Japan, Singapore, and South Korea will be the chief contributors to the industry growth in this region. Heightened research activity, mostly in the field of medical application of the product, is expected to propel the metamaterial technologies market in Asia Pacific. Global metamaterial technologies market is highly fragmented with U.S based companies accounting for a major chunk of the market. Kymeta Corporation, Echodyne, Evolv Technologies, Metamagnetics Inc., and Metamaterial Technologies are the major product manufacturers. Other important industry players include Applied EM Inc., Alight Technologies, Colossal Storage Corporation, Fianium, Fractal Antenna Systems, Inframat Corporation, Luminus Devices Inc, Medical Wireless Sensing Ltd., Nanosteel Company, Opalux, and Sandvik Materials Technology AB. It is difficult for companies operating in the global metamaterial technologies market to apply backward integration to their supply chains as it lies in a completely different field of operations. Manufacturers are increasingly dependent on outside funding and investment for their R&D activities due to the costly nature of these activities. For example, Kymeta Corporation received USD 12 million for developing the metamaterial surface antenna technology from Bill & Melinda Gates Foundation; Liberty Global, and an investment firm known as Lux Capital. Most of the products have not been commercialized and are still in the development stage. There are many technical challenges regarding the commercial use of these products as there is a vast difference between theoretical study and practical implementation. Global metamaterial technologies market is at a nascent stage and has immense growth potential in the next few years as its commercial popularity increases. There are many start-up companies operating and dominating the industry and these firms rely on funds and investments from outside players for the development of these products. Although most of the firms in the global metamaterial technologies market are located in North America, there is increased collaboration among them and their counter parts in other regions of the globe to develop these materials and related technologies.